The blogging learning curve is steep . . . very steep. There is so much to learn. And what you do learn, you have to figure out how to use in your business. How do I apply this information to my business? How does I do what food bloggers do if I’m a DIY site? Can I use that plugin, or is it just for lifestyle bloggers? Where do I get traffic, if I’m not a Pinterest person? There’s just so many questions. And then there’s the technology . . . If I’m not on WordPress, how do I do that? 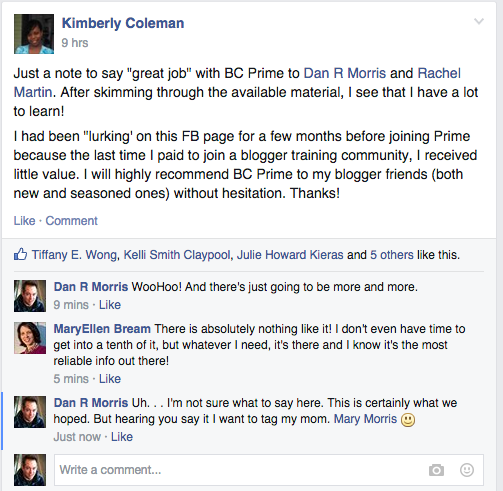 That’s why we created BC Prime. And why we add to it every week. We’ve got 3 courses we want you to start with. Snowball Summit – An 8 video course on how long does it take to make it? And what does it take to make it? Biz Blogging Curriculum – Everything you need to get up and going as a professional blogger. 21 Day SEO Challenge – Learn where should you put your time, effort and focus to acheive leverage. Speed. There is so much to learn and without a team, it could take forever. SO BC Prime is your team. Need to know how to use Snapchat so you can join and just start using it instead of fumbling around to figure it out? We create 3- 5 minute video tutorials for you. And have already created more than 20. Need a legal form/agreement so you can create an ebook with a friend? We create that for you. Need graphics for your blog posts? We got those for you. Need turquoise social media buttons? We got those for you. You don’t need to buy them. More books than you could ever read? We do summaries for bloggers to save you time. Themes . . . and that’s just off the top of my head. With BC Prime . . . all of that is included.